Note: The following information discusses viewing tasks associated with a particular lease application. For information on creating and viewing auto tasks that apply to ALL lease applications, click here. 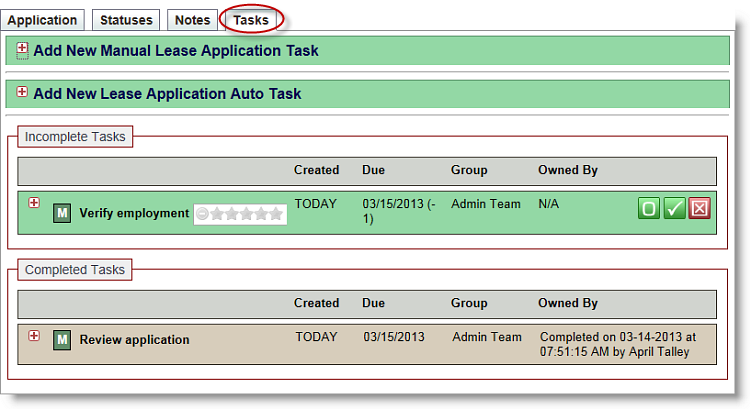 When you view tasks that are associated with a specific lease application on a property, you can view task detail, change a task's due date, add recurrences to a task, assign a task to a user, change group or user assignments, attach notes and documents, send emails, claim ownership to un-owned tasks, delete tasks, and mark tasks as complete. You can also create Manual Tasks or trigger previously created Auto Tasks from here. 1. From the Lease Apps sub tab at left, locate the lease application for which you wish to view the tasks. 2. Click the + adjacent to the applicant's name to expand the information. 3. Click the Tasks sub tab (shown circled in red below) to view any tasks that exist for the application. As shown in the following screen shot, both Incomplete and Completed tasks will display, so you are able to view open tasks as well as track the application's task history. 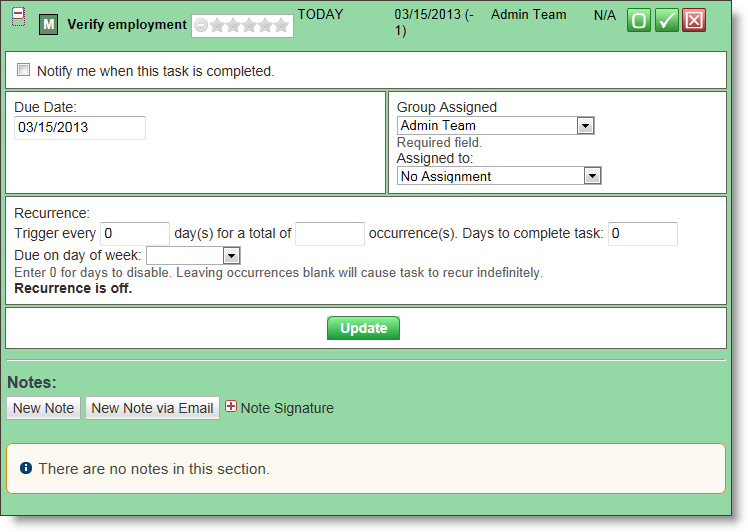 You can also create new tasks using the Add New Manual Task or Add New Auto Task features. Click here for more detailed information on adding a new Auto Task that is specific to this application only. Click here for more detailed information on creating a Manual Auto Task for this application.